For the perfect mix of vintage style and modern convenience, look no further than this dual-function, freestanding paper and brush holder. With its solid-brass construction, and your choice of four tarnish and corrosion-resistant finishes, it's suited for a variety of decors. 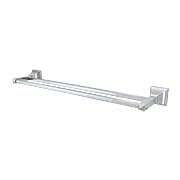 Ideal for larger bathrooms, or as a space saving solution for smaller bathrooms. 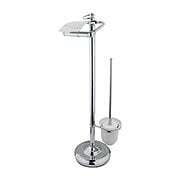 Complete the look of your bathroom with the clean lines and understated elegance of this freestanding tissue-paper holder. Constructed of sturdy, solid brass, it's suited for a variety of interiors with your choice of four tarnish and corrosion-resistant finishes. 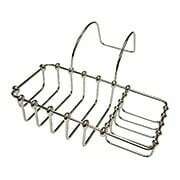 Convenient and stylish, use it in larger bathrooms, or a as a space saving solution for smaller bathrooms. The Daytona collection evokes 1930's glamour with bold, refined lines and classic accents. Constructed of solid brass, this dual towel bar comes in your choice of three premium tarnish and corrosion resistant finishes. With its hexagonal shaped rosettes and sturdy silhouette, it is ideal for daily use or for displaying your favorite decorative towels. Suited for a variety of interior styles, our Claremont freestanding bathroom towel holder is perfect for daily use, or for displaying your favorite decorative towels. 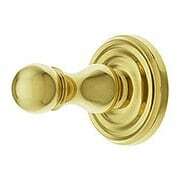 Constructed of quality solid brass, it comes in your choice of three lustrous, tarnish and corrosion-resistant finishes. 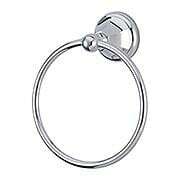 It's ideal for larger bathrooms, or as a space saving solution for smaller bathrooms. The Daytona collection evokes 1930's glamour with bold, refined lines and classic accents. 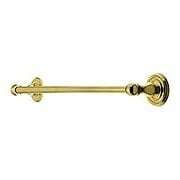 This dual-style bath hook is constructed of solid brass, and features hexagonal rosettes. 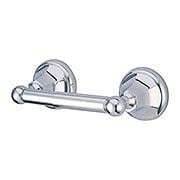 With your choice of four tarnish and corrosion-resistant finishes, it is at home in almost any bathroom decor. The Daytona collection evokes 1930's glamour with bold, refined lines and classic accents. This paper holder is constructed of solid brass, and features hexagonal rosettes. 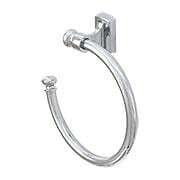 With your choice of three tarnish and corrosion-resistant finishes, it is at home in almost any bathroom decor. A mix of premium materials and a classic design make our Swinging Toilet-Paper Holder a smart choice for any bathroom. 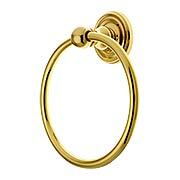 Constructed of solid, forged brass, it features a sleek arm and crisp, ringed rosette. For easy installation, the concealed mounting spindle comes complete with metal screw anchors, and the plastic bushing allows for smooth, squeak-free motion. Choose from seven popular finishes. 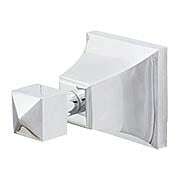 A mix of premium materials and a classic design make this Toilet-Paper Holder a smart choice for any bathroom. 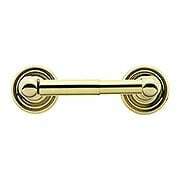 Constructed of solid, forged brass, it features a smooth roller and crisp, ringed rosettes. 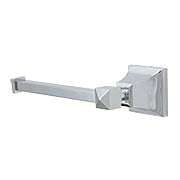 For easy installation, the concealed mounting spindle comes complete with metal screw anchors. Choose from seven popular finish options. 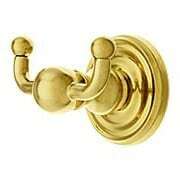 Solid forged brass expresses the simple grace of a hook and rosette in seven regal finishes. A true style chamelon, this accent complements interiors of all persuasions. Fully concealed mounting. 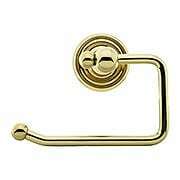 Solid forged brass expresses the simple grace of a hook and rosette in seven regal finishes. A true style chamelon, this endlessly useful double hook complements interiors of all persuasions. 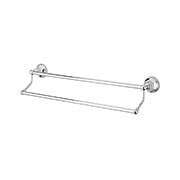 Our Towel Bar with Classic Rosettes adds elegant style to any bath. 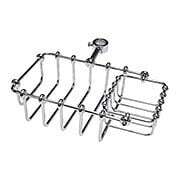 Made of solid, forged brass, this premium bath accessory is available in an array of popular finish options. 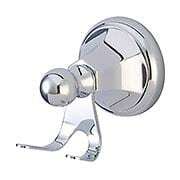 Includes concealed mounting spindles and metal screw anchors for installation. Bold, geometric, and streamlined the Cooper collection brings sophisticated style to your bath. 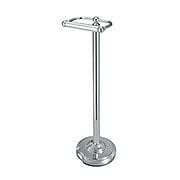 Constructed of solid brass, this toilet paper holder comes in your choice of polished chrome or satin nickel finishes. Suited for a variety of interiors, its fully concealed mounting offers a clean look that can be installed in minutes! Bold, geometric, and streamlined the Cooper collection brings sophisticated style to your bath. 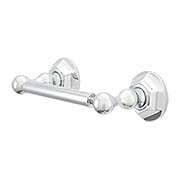 Constructed of solid brass, this dual towel bar comes in your choice of polished chrome or satin nickel finishes. Whether for daily use, or for displaying your favorite decorative towels, it is suited for a variety of interiors. 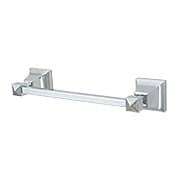 Fully concealed mounting offers a clean look that can be installed in minutes! Bold, geometric, and streamlined the Cooper collection brings sophisticated style to your bath. 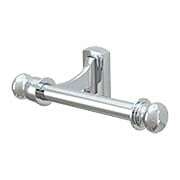 Constructed of solid brass, this hand towel bar comes in your choice of polished chrome or satin nickel finishes. Whether for daily use, or for displaying your favorite decorative towels, it is suited for a variety of interiors. Fully concealed mounting offers a clean look that can be installed in minutes! Bold, geometric, and streamlined the Cooper collection brings sophisticated style to your bath. 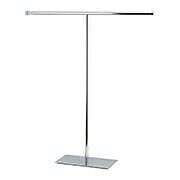 Constructed of solid brass, this towel bar comes in your choice of polished chrome or satin nickel finishes. Whether for daily use, or for displaying your favorite decorative towels, it is suited for a variety of interiors. Fully concealed mounting offers a clean look that can be installed in minutes! Bold, geometric, and streamlined the Cooper collection brings sophisticated style to your bath. 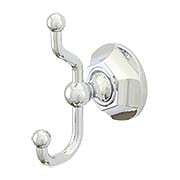 Constructed of solid brass, this towel hook comes in your choice of polished chrome or satin nickel finishes. Suited for a variety of interiors, its fully concealed mounting offers a clean look that can be installed in minutes! 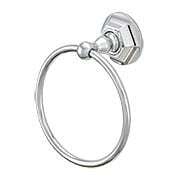 The Beacon Towel Hook celebrates classic style with a transitional twist. 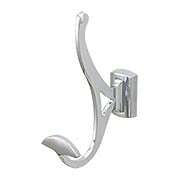 This towel hook features refined shapes combined with fitting details like beveled edges and an ergonomic feel. Versatile and understated, it is a charming addition to any bath. 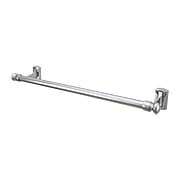 The Beacon Towel Bar celebrates classic style with a transitional twist. 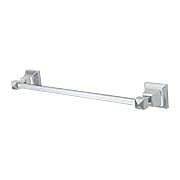 This towel bar features refined shapes combined with fitting details like beveled edges and an ergonomic feel. Versatile and understated, it is a charming addition to any bath. The Beacon Toilet Collection celebrates classic style with a transitional twist. This toilet paper holder features refined shapes combined with fitting details like beveled edges and an ergonomic feel. Versatile and understated, it is a charming addition to any bath. Functional, yet fashionable, the Edwardian Collection lends classic style to your bath. 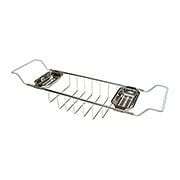 Featuring a hexagonal rosette and double hook, this sturdy accent is ideal for hanging towels, robes, and more. Your choice of an array of finishes make it easy to match your decor. Functional, yet fashionable, the Edwardian Collection lends classic style to your bath. Featuring hexagonal rosettes, this sturdy toilet paper holder is made for long lasting wear. Your choice of an array of finishes make it easy to match your decor. Functional, yet fashionable, the Edwardian Collection lends classic style to your bath. 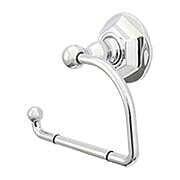 Featuring a hexagonal rosette, this sturdy toilet paper hook is made for long lasting wear. Your choice of an array of finishes make it easy to match your decor.